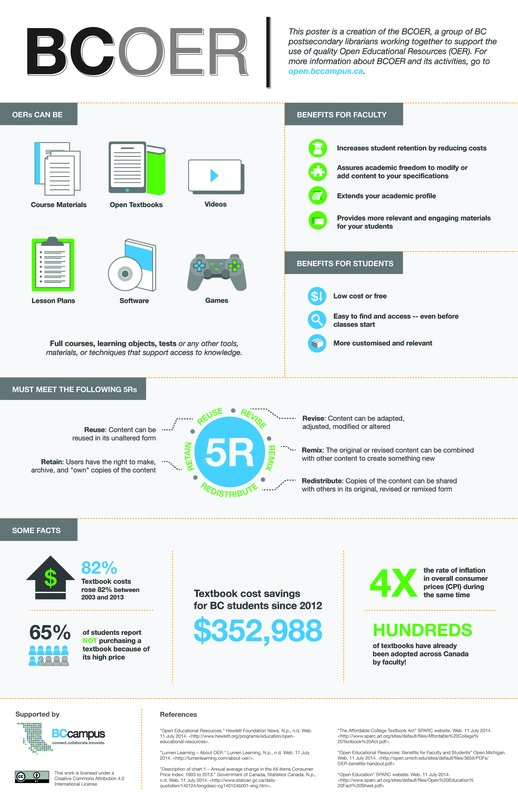 As can be seen in the BCOEL (formerly BCOER) infographic below, there are many reasons to use OER, including increasing student retention and providing more relevant materials for your classes. The following video explains why the move to Open Education (and the use of OER) is so important. In the following two videos, you will hear from faculty who are using open textbooks and some of the reasons why. Why use open textbooks? Benefits for students from BCcampus on Vimeo. What instructors say about open textbooks from BCcampus on Vimeo. The Faculty Perspectives on Open Textbooks section above from the BC Open Textbook Adaptation Guide by BCcampus and is used under a CC BY 4.0 international license. Download this book for free at http://open.bccampus.ca. Why use OER? by Shannon Moist is licensed under a Creative Commons Attribution 4.0 International License, except where otherwise noted.